Unfortunately, such pictures as this have become a rarity. 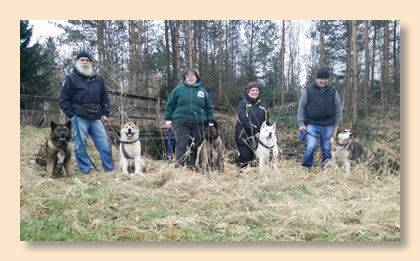 Our proud Akita group at our dog school is getting old. First, there are our unforgettable Cheyenne, Brünchen, Aaron, Bea and Aika, who have gone one after another over the rainbow bridge in recent years. Secondly there are Jane, Akyo and Eishinyoo which already belong to the Akita seniors (12+) and coping with smaller hills - as here the Hutberg in Großharthau – has become increasingly difficult or is even not possible anymore. We remember the many eventful experiences that we had with our Akitas. But we do not want to be sad, because it was a great time and it is so still. 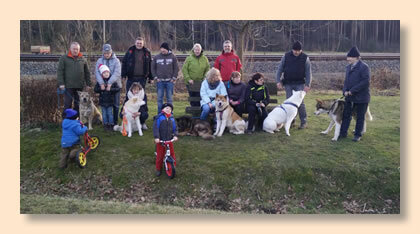 May some nice days at Hupfsch wait for us and our doggies and who knows - maybe one or the other Akita puppy sooner or later will join us again. Es war so ein schöner Samstag und vor allem, dass wir uns alle mal wieder gesehen haben, wie in alten Zeiten!